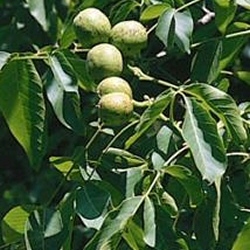 Buy Common Walnut Tree (Juglans regia) online from UK tree supplier of garden ornamental trees. A very regal tree, hence its latin name Juglans regia. The Common Walnut was thought to have arrived in Britain with the arrival of the Romans. The Common Walnut (Juglans regia) is a native tree of South-East Europe. Found largely in the Southern and Central regions of Britain, it is rarer in the North of the country. Valued for its timber, this tree makes for a stately tree given a large garden, as its height is a mere 30m (100ft). A slow-growing tree, this tree has a delightful aromatic folaige. Did you know that wine can be made from this foliage? Juglans Regia although considered an ornamental tree will produce nuts but will take a long time so do not buy this for nuts if you are near retirement or have discovered the secret of eternal youth. If you are planning on giving nuts to your children after you shuffle off this planet then Juglans Regia Walnut will be a good choice for you. Our Common Walnut Trees are supplied at a height of 1.5 to 1.7 metres in a 12 litre container for year round planting and better results than from bare-root or rootballed stock.